Aurora 2000 - Extremely Fast and Efficient. This passenger ferry catamaran - build in 1990 - is considered one of thee most desirable people movers.Our office is pleased to offer directly by the owner the following 38.8m catamaran passenger vesselfor sale. This Fjellstrand design is widely respected and is offered in good condition. Our office is holding extensive details and can arrange prompt inspection. United Yacht Sales New Jersey would love to guide you through a personal showing of this 124' Passenger Ferry Kvaerner Fjellstrand Aurora 2000 1990. This yacht for sale is located in Palm Beach, Florida and priced at $750,000. For a showing please contact us by filling out the form on this page and we will get back to you shortly! HULL TYPE: . . . . . . . . . . . . . . . . . . . . . . . . . . . . . . . . CatamaranLENGTH OVER ALL (L.O.A).: . . . . . . . . . . . . . . . . . . . 127 feetBEAM: . . . . . . . . . . . . . . . . . . . . . . . . . . . . . . . . . . . . 30.9 feetDRAFT: . . . . . . . . . . . . . . . . . . . . . . . . . . . . . . . . . . . . 5 Feet 3 InchesGROSS TONS: . . . . . . . . . . . . . . . . . . . . . . . . . . . . . . 442 TonNET TONS: . . . . . . . . . . . . . . . . . . . . . . . . . . . . . . . . . 156 TonsPROPULSION SYSTEM: . . . . . . . . . . . . . . . . . . . . . . . Twin MTU 16 cylinder Turbo chargeddiesel enginesFUEL TYPE: . . . . . . . . . . . . . . . . . . . . . . . . . . . . . . . . . Diesel FuelFUEL CAPACITY: . . . . . . . . . . . . . . . . . . . . . . . . . . . . Port and starboard fuel tanks capacitiesare 1,728 gallons of each.AC POWER: . . . . . . . . . . . . . . . . . . . . . . . . . . . . . . . . 115 V.A.C.\ 230 V.A.C.DC POWER: . . . . . . . . . . . . . . . . . . . . . . . . . . . . . . . . 12 V.D.C\ 24 V.D.C.FRESH WATER CAPACITY: . . . . . . . . . . . . . . . . . . . . . Port and starboard total capacity forpotable water is 456 gallons.INTENDED USE/BUYER: . . . . . . . . . . . . . . . . . . . . . . . 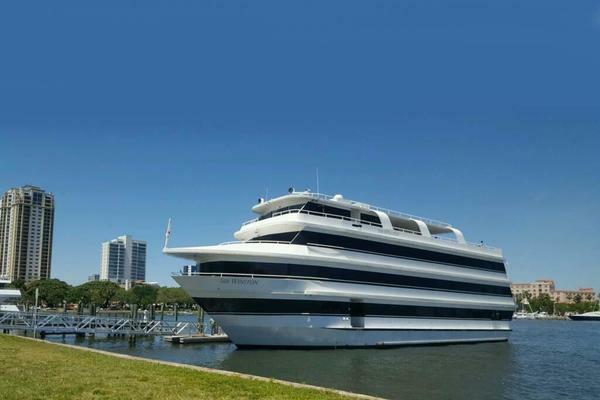 Passenger ferry vessel.BUYER'S EXPERIENCE: . . . . . . . . . . . . . . . . . . . . . . . License Captain aboardINTENDED CRUISING AREA: . . . . . . . . . . . . . . . . . . . Florida waters and Bahama Island waters.INTENDED USE: . . . . . . . . . . . . . . . . . . . . . . . . . . . . Passenger ferry boat. HULL CONSTRUCTIONTYPE:Catamaran with sharply raked bow stems semi-V planing hull with hard chines.MATERIAL:7/16 inch electrical welded aluminum plating.EXTERIOR HULL:Port and starboard hulls are painted blue with white painted cabin super structure.BULKHEADS:7/16 inch electrical welded aluminum plated bulkheads.STRINGERS:Hull stiffness provided by aluminum longitudinal stringers. Complete inspection not possibledue to limited access. Appears serviceable where observed.STEM:Sharply raked port and starboard bow stems.TRANSOM:Port and starboard square transoms.BILGE:Deep (below decks) bilge area provides the area for most boat systems and tankage.CHAIN LOCKER (DRAINAGE):Anchor chain locker center bow deck.LIMBER HOLES:Limber holes are of adequate size and clear where sighted.FRAMES (RIBS):Aluminum frames (ribs). Appeared serviceable where sighted.DECK CONSTRUCTIONTYPE:Decks are 7/16 inch thick electrical welded aluminum plating.MATERIAL:Aluminum.DECK FITTINGSSTANCHIONS:Aluminum stanchions and safety rails around the perimeter of the bow deck and aft deck. FITTINGS (continued)CHOCKS AND CLEATS:Two Port (2) and two Starboard (2) aluminum bollard type cleats on Bow deck. There are alsoPort and Starboard 12 inch aluminum horn cleats approximately mid ship.Two Port (2) and two Starboard (2) aluminum bollard type cleats on Aft deck. There are alsoPort and Starboard 12 inch aluminum horns clears approximately mid ship.WINDLASS/GIPSY:115 V.A.C./230 V.A.C, anchor chain windlass located on the center line bow deck.HAWSE PIPES:Aluminum hawse pipe.DECK SURFACE:7/16 inch thick electrical welded aluminum plating with anti skid surfaces.HATCHES:Anchor chain locker hatch.ANCHOR PLATFORM:Aluminum anchor chute with roller assembly.DAVITS:Hydraulic davit crane on upper aft deck. Inoperable.SUPERSTRUCTUREMATERIAL:Cabin superstructure is 7/16 electrical welded aluminum plating.DECK HATCHES:Anchor chain deck hatch.WINDOWS/PORTS/DOORS:Vessels upper deck and lower deck cabins are fitted with forty (40) large tempered tintedviewing safety glass windows.BRIDGE DECKMATERIAL:Upper level passenger seating with aircraft blue fabric/vinyl covered seats. Forward of thepassenger seating is the pilot house furnished with electrical adjusting helm seat and port andstarboard electrical adjusting copilot's seats.SEATS:265 aircraft type fabric/vinyl passenger seats with adjustable head rest.WINDSHIELD:Pilot house windshield panels are tempered tented safety glass. BRIDGE DECK (continued)SAFETY RAIL SYSTEM:Tubular aluminum safety rails around the perimeter of bow deck and around the perimeter ofupper aft deck and around the perimeter of lower aft deck.ADDITIONAL EQUIPMENT AND ACCESSORIESGENERAL EQUIPMENT:Hydraulic dvit.DINGHY/TENDERS:14 foot fiberglass tender powered with Mariner 60 horsepower gasoline outboard engine.DOCK LINES:Adequate 2 inch diameter nylon docking lines.CABIN APPOINTMENTSINTERIOR DESCRIPTION:STORAGE AREAS:Adequate storage for passenger's suite cases and luggage.HEADLINERS:Blue fabric cloth headliner in upper level and lower level passenger seating areas.FABRIC AND CUSHIONS:Blue fabric cloth/vinyl aircraft type passenger chairs with adjustable head rest.FLOOR AND WINDOW COVERINGS:Blue carpet.HEADS:Eight (8) head facilities.LIGHT FIXTURES:12 volt lighting throughout vessel.AIR CONDITIONING UNITS:Vessel's upper deck passenger cabin and passenger lower deck passenger cabin, and thtpilothouse are air conditioned.CABIN HEATING:The air conditioner units are reverse cycle for heat.TELEVISIONS:Upper deck level passenger's cabin and lower deck passenger's cabin hav e four (4) televisions. LOCATION:Lower level deck snack bar. TYPE:Twin MTU turbo charged 16 cylinder diesel engines.MANUFACTURER:Twin MTU turbo-charged diesel enginesHORSE POWER:2000 horsepowerNUMBER OF CYLINDERS:16 cylindersTHROTTLE CONTROLS:Kamewa hydraulic jet drive propulsion controls.ENGINE MOUNTS AND BED:Aluminum engine bedsLUBRICATION:Level and Condition: Level indication is normal both port and starboard. The appearance of theoil is very black. Note: The surveyor recommends that all engine fluids and filters be renewedas soon as possible.VENTILATION:115 V.A.C/ 230 V.A.C. engine room Port and Starboard extractors.BILGE BLOWERS:115 V.A.C./230 V.A.C. port and starboard engine room extractorsEXHAUST SYSTEM:Raw water cooled with cast iron risers and cast iron pipes then exiting through the transom.Reinforced exhaust hoses to pipe connections are double clamped where sighted and appearedserviceable.FUEL TRANSFER (PUMPS):115 V.A.C./ 230 V.A.C. Fuel transfer pumps located in port and starboard engine rooms.ENGINE ALARMS:Low oil pressure alarm and coolant over heat warning audible at helm station. Appearsserviceable. COOLING SYSTEMTYPE:Port and starboard engines are fresh water cooled with enclosed reservoirs cooled by heatexchangers.RAW WATER STRAINERS:Aluminum sea water strainers with sight glasses.COOLANT LEVEL:Normal level observed.HOSES AND CLAMPS:Reinforced cooling water rubber hoses double clamped and well routed and supported wheresighted.BELTS AND PULLEYS:Pulley belts condition appeared serviceable.SEACOCKS AND STRAINERS:Bronze ball-valves. Serviceable condition. MAIN ENGINE(S) FUEL SYSTEMFUEL TYPE:Diesel fuelMATERIAL:7/16 inch thick steel electrical welded fuel tanks.NUMBER OF TANKS:Two (2) aluminum diesel fuel tanks.TANKS CAPACITY:Port and starboard 1728 gallon capacity fuel tanks.SECURED:Electrically welded to the port and starboard hulls.LOCATION:Port and starboard aft engine rooms.FILL PIPE LOCATIONS:Port and starboard topsides above the rub rails and on the aft deck center line.FILL PIPE GROUNDED:Port and starboard fuel tank fills are properly grounded.FILL PIPE MATERIAL:Steel piping and U. S. Coast Guard approved B-1 reinforced rubber fuel hoses. MAIN ENGINE(S) FUEL SYSTEM (continued)FILL PIPE FITTINGS:Fill deck fitting clearly marked as to fuel type: "Diesel fuel".HOSE CONNECTIONS, CLAMPS:Fuel hoses double clamped where sighted. Appeared serviceable.FUEL LINES AND FITTINGS:Copper fuel supply lines and copper fuel return lines with copper alloy fittings.FUEL MANIFOLD VALVES:Port and starboard fuel tanks fitted with fuel manifolds with ball valves.VENT LOCATION:Port and Starboard outboard topsides below port and starboard fuel fill pipes.SHUT-OFF VALVE:Ball valves at tanks, Racor fuel filters/water separators, and the central manifold systems.Appeared serviceable.FUEL FILTERS:Triple remote Racor 75/1000 fuel filters/water separators for port and starboard engines.FILTER/FUEL CONDITION:Appears serviceable. ELECTRICAL SYSTEM (D.C. SYSTEM)VOLTAGE:12 V.D.C./24 V.D.C. systems.BATTERIES:Eight (8) 12 volt Group 31 lead-acid batteries inside of the port and starboard engine rooms.New. Six (6) 12 volt 8-D lead-acid batteries located in the pilothouse. These batteries are forpowering up navigation and communication electronics.BANKS:Five (5) battery banks.MAIN BATTERY SWITCHES:Rotary selector battery switches.PANEL:12 volt and 24 volt distribution panels with designated circuit breaker switches and voltmetersand ampmeters.BREAKERS/FUSES:Breaker switches. ELECTRICAL SYSTEM (D.C. SYSTEM) (continued)TYPE CONNECTORS:Round captive lug type. Where sighted appeared serviceable.ROUTING/SUPPORT:Well supported and secured where sighted.CHARGING SYSTEM (BATTERY CHARGER):Eltek power inverters for charging batteries located in the port and starboard engine rooms andlocated in the pilothouse. Serviceable condition.CHARGING SYSTEM (ALTERNATOR):24 volt belt driven alternators on port and starboard main engines. 12 volt belt drivenalternators on port and starboard generator engines.ELECTRICAL SYSTEM (A.C. SYSTEM)MAIN BREAKER:The 115 V.A.C. and 230 V.A.C. main circuit breaker switches are fitted on the main 115 V.A.C.and 230 V.A.C. distribution panels. Serviceable condition.BRANCH BREAKERS:Individual designated circuit break switches. Serviceable condition.CIRCUIT LOAD MONITORS:115 V.A.C. and 230 V.A.C. voltmeters and ampmeters. Serviceable condition.CONNECTIONS (TYPE):Captive lug type. Appeared serviceable.WIRE TYPE (SIZE AND RATING):Size and rating where sighted appeared well routed and supported. Serviceable for intendeduse.ROUTING:Well routed and supported where sighted.OUTLETS:Various V.A.C. outlets available throughout vessel. Appeared adequate and convenientlylocated. Appeared serviceable.GENERATORS AND INVERTERSTYPE:Port and starboard engine room diesel powered generators.MANUFACTURER:Port and starboard Merecedes diesel powered generators. Serviceable condition. FUEL TYPE:Diesel fuel. GENERATORS AND INVERTERS (continued)KILOWATT RATING:Port and starboard engine room 200 K.W. generators.VOLTAGE RATING:115 V.A.C./230 V.A.C. voltage rating.NUMBER OF CYLINDERS:Generator engines are 6 cylinders.LOCATION:Port and starboard aft engine rooms.FLUID LEVELS:Coolant normal. Oil normal. Surveyor recommends that all fluids be renewed according to themanufactures recommended specifications.COOLING SYSTEM:Port and starboard generator engines are fresh water cooled by heat exchangers.FUEL SUPPLY:Diesel fuel.FUEL FILTER:Remote Racor 900 MA fuel filters/water separator.LUBRICATION SYSTEM:Engine mounted mechanical oil pumps with spin on/off type filters.EXHAUST SYSTEM:Aqua lift type FRP (fiber reinforced plastic) silencers.. Raw water cooled exhaust with doubleclamps where sighted. Appeared serviceable.FLAME ARRESTOR:U. S. Coast Guard approved.ACCESSIBILITY:Good.WARNING LABELS: The required labels appeared to be in place and readable. FRESH WATER SYSTEM: (POTABLE WATER)STORAGE TANKS:Port and starboard electrical welded aluminum potable water tanks.CAPACITY:Port and starboard 228 gallons each potable water tanks. FRESH WATER SYSTEM"Aurora 2000" surveyed by Kelly Marine Surveyors, Inc. - Ft. Lauderdale, FL 33316 Page 15 of 22FRESH WATER SYSTEM: (POTABLE WATER) (continued)ACCESS:Access to tanks and valves appeared adequate.INSPECTION/CLEANING ACCESS:Serviceable.MATERIAL:Water tanks are constructed of 7/16 inch thick electric welded aluminum plating.FILL PIPE LOCATION:Port and starboard aft decks.VENT PIPE LOCATION:Port and starboard outboard topsides below water fills.PUMPS:115 V.A.C/230 V.A.C. motors/water pumps located inside of the port and starboard enginerooms. Serviceable condition.HOSES AND CLAMPS:Copper tubing and fittings throughout vessel.FRESH WATER SYSTEM (HOT WATER SYSTEM)TYPE:Port and starboard custom built 7/16 inch thick hot water tanksCAPACITY:Port and starboard 50 gallon hot water tanks.PRESSURE RELIEF VALVE:Copper pressure relief valve built into tanks.SANITATIONSANITATION (BLACK WATER)MANUAL OR ELECTRIC TYPE:Pressurized house hold type toilets.NUMBER OF HEADS:Eight ((8) head facilities. TYPE:Kamewa hydraulic steering bucket STEERING SYSTEM"Aurora 2000" surveyed by Kelly Marine Surveyors, Inc. - Ft. Lauderdale, FL 33316 Page 16 of 22STEERING SYSTEM (continued)MANUFACTURER:KamewaNUMBER OF STATIONS:One (1) steering stationLOCATIONS:PilothouseLINES AND FITTINGS:Reinforced flexible hydraulic hoses with metallic fittings. Appeared serviceable.GROUND TACKLEGROUND TACKLEANCHORS:Danforth type 200 lb. galvanized steel anchor.CHAIN:200 feet of 3/4 inch diameter galvanized steel anchor chain.WINDLASS:Hydraulic anchor chain windlass.ELECTRONICS AND NAVIGATION EQUIPMENTELECTRONICS AND NAVIGATION EQUIPMENTVHF:Four (4) Sailor VHF radios.RADAR:Racal Decca Bridge Master II 72 mile radar.AUTOHELM:Robertson AP-9 MK II automatic pilotCOMPASSES:Bergen Norway 6 inch magnetic steering compass.THRU-HULLSTHRU-HULLS:THRU-HULLS LIST:Aluminum thru-hull fittings.LOCATION:Port and starboard engine rooms. THRU-HULLS: (continued)USE:Port and starboard main engine's cooling water. Port and starboard generator engine's coolingwater.MATERIAL:Aluminum.TYPE:Ball valves.BONDED:Bonded where sighted.CONDITION:Serviceable condition.OPERABLE:Ball valves are operable. VISUAL DISTRESS SIGNALS:Visual Distress Signals are out of date.SOUND DEVICES:Trumpet air signal horn.NAVIGATION LIGHTS:Sidelights are operable. Mast head light is operable. Stern light is operable. Anchor light isoperable.INLAND NAVIGATION RULE BOOK (12M-39'4" OR LONGER):Inland and International Rules of the Road is aboard vessel. "NO OIL DISCHARGE" PLAQUE:Found properly displayed in engine spaces.AUXILIARY SAFETY EQUIPMENTLIFE RAFT:Eight (8) 25 person canister survival rafts. Life rafts need servicing.E.P.I.R.B. :Jotron E.P.I.R.B. inside the pilothouse.FIRE ALARMS:Firer alarm inside of pilothouse.BILGE WATER ALARM AND SAFETY SWITCHES:Bilge high water alarm in port and starboard aft engine rooms.FIXED FIRE EXTINGUISHING SYSTEM (HALON TYPE):FE 200 Clean Agent fire suppression systems are inside of port and starboard engine rooms.Recently serviced.FIRST AID KIT:Vessel has small hospital facility aboard.MAN OVERBOARD SYSTEM:Throwable 36 inch Jim Buoy ring buoys.BILGE PUMPSLIST:Fourteen (14) 24 volt submersible bilge pumps with automatic float switches located in portand starboard engine room's water tight bilge compartments. Serviceable condition.